Description: Rose was commissioned for this piece by chance, but wow, what a great coincidence! Looks great, Rose! I was looking for art paper and after a couple of hours searching the town, we were getting in the car when my friend said, "Try the art shop right there". I thought it would be too expensive but I went in. Well I got my paper, cheapest in town, the lady saw the wire work pendant I was wearing and I informed her I made jewelry. Two days later she called me to do some work for her partner, seemingly he had been searching for a wire worker to put some stones in a pendant for himself, and had asked the Universe to send someone. A week later he was giving me his stones to make his pendant. This is the finished product. He loves it. The wire is copper 18g/1.00mm for the structure. 20g/0,80mm square for the bail and round for the weaving structure and 27g/o.315mm for the weaving and coiling. I added to his piece of amber and quartz 5 fresh water pearls to accent and balance the piece, he informed me later that pearls were his first love. It measures 6cm x 3cm approx. I too wanted to do this type of pendant for such a long time till I found a tutorial on it. I of course as soon as I sorted out how to do it..changed it to suit me. If I said that you need a base, a foundation of heavy gauge wire [16g/1.25mm] then a bail with a normal bail gauge wire [20g/0.8mm]. 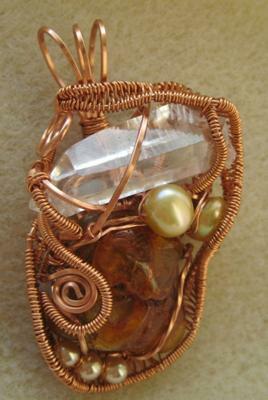 After that you add the stones, wrapping them first if needed, then add your coils, wire etc. It is a work of art that builds as you look at it, work with it and experience each stone and it's place on the 'canvas'. I make the foundation with 2 sets of open loops. 1 smaller than the other and them 'kissing' each other. The big loop is about 1 inch in diameter and the second loop is approx 1/2 inch in but slanted to merge with the bail. I hope you have enough to go on, as I can't share the tutorial...but go and play, as it is truly a unique piece every one you do. The turquoise sculpture on here is also mine...and see how different they are. Impressive, would love to be able to do that. I have a few stones I could use. Wish I could give you more than 5 stars.